The abduction of a young woman in 1858 ends in Toronto thirty-eight years later - in murder. In 1858, a young woman on her honeymoon is forcibly abducted and taken across the border from Canada and sold into slavery. Thirty-eight years later, Detective Murdoch is working on a murder case that will take all of his resourcefulness to solve. The owner of one of Toronto’s livery stables has been found dead. He has been horsewhipped and left hanging from his wrists in his tack room, and his wife claims that a considerable sum of money has been stolen. Then a second man is also murdered, his body strangely tied as if he were a rebellious slave. Murdoch has to find out whether Toronto’s small “coloured” community has a vicious murderer in its midst - an investigation that puts his own life in danger. 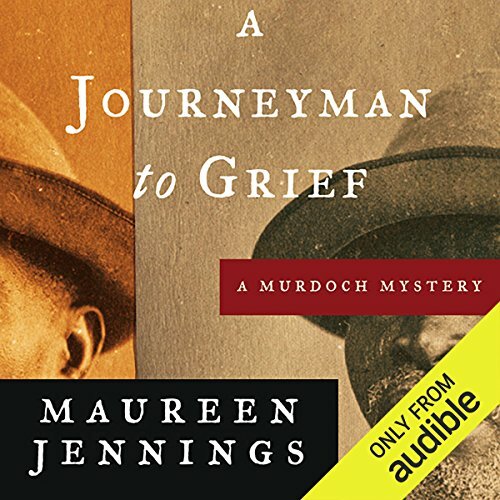 Maureen Jennings’s trademark in her popular and acclaimed Detective Murdoch series is to reveal a long-forgotten facet about life in the city that dispels any notion that it really ever was “Toronto the Good.” As well, in A Journeyman to Grief, an exceptionally well plotted and engrossing story, she shows just how a great harm committed in the past can erupt fatally in the present. ©2007 Maureen Jennings (P)2012 Audible, Inc. This is the seventh book in the Detective Murdoch series. In this one a 38-year-old secret leads to murder in Toronto. In 1858, a Mulatto woman in Canada was kidnapped on her honeymoon in Niagara Falls. Her Caucasian husband is implicated in selling her into slavery. In 1896, Murdoch must solve two murders and an attempted murder to determine what happened, and how this kidnapping gave rise to the current murders. A very good book which allows us to see the problems of slaves who escaped through the underground railroad to Canada where their problems were not over. This book had the feeling of finality as various relationships in the series were resolved, but I hope I’m wrong. I love this series and the people so involved.